12 Sep Before & After: How to tackle that big/long/white/hallway wall! We’ve been working with Todd and Heather on the finishing decorative touches to their newly renovated home. One of the biggest challenges we faced was trying to figure out how to fill in a very large long white hallway while not spending an enormous amount of money! 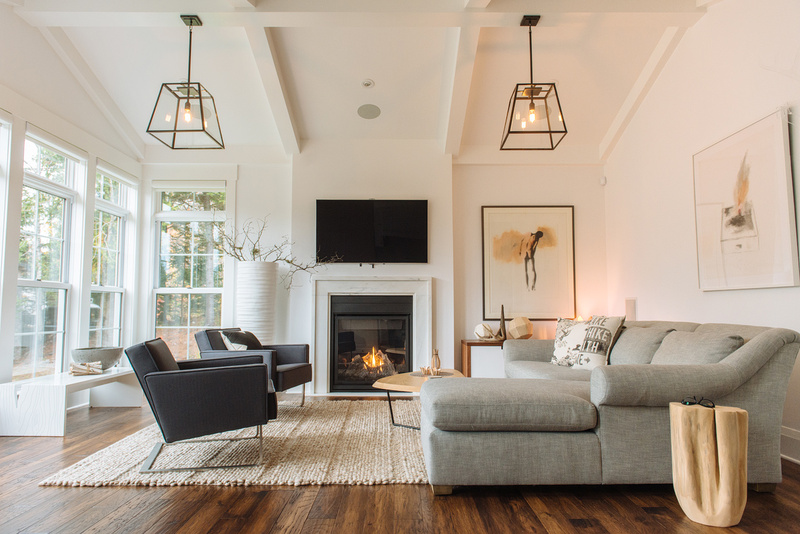 This issue isn’t especially unique; large walls and long hallways are a common feature in many homes. This hallway was particularly tricky as it is visible through glass from below, part of a double height open space. Additionally, you can see from the pictures that there are a lot of strong angles and the beams to take into account. 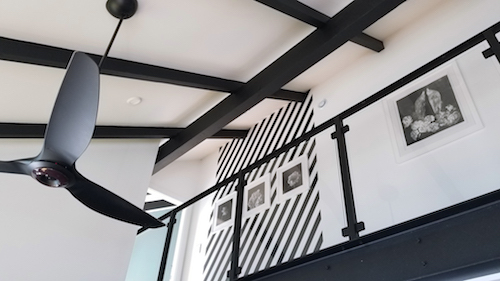 Rather than resist the drama of the black beams we decided to echo and extend their effect by painting evenly distributed black stripes on an angle on part of the wall. 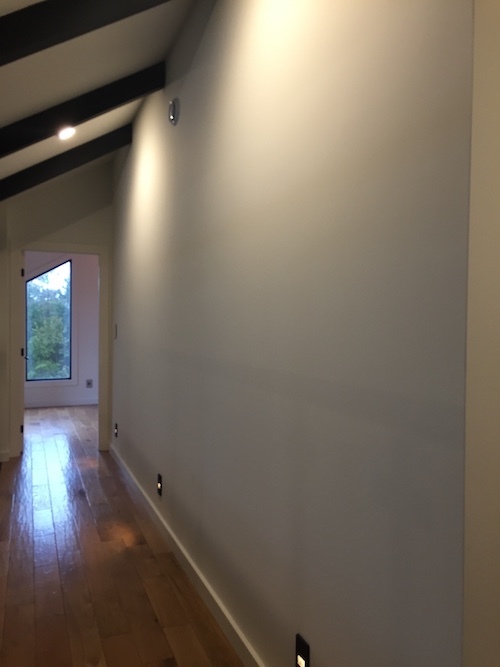 We created a CAD drawing for the painters (Legacy Painters) and with green painter’s tape and a steady hand, the wall now creates depth and a backdrop for artwork. In that they’re collectors of Ryan Livingstone’s artwork (they have six other pieces throughout the house) we chose this particular monoprint by Ryan to go on the right hand side of the hallway – two ravens among peonies. We then suggested that Heather, a talented photographer/artist in her own right, take some photos of peonies in black and white and frame them to be hung in the diagonally-striped wall. As framed by Mario’s Picture Framing, the results are spectacular. All photography by Heather Tufts! With special guest appearances by Duke & Daisy!